MISS ANNIE OAKLEY, THE CHAMPION RIFLE SHOT, NOW WITH BUFFALO BILL. MISS ANNIE OAKLEY the Police Gazette female champion rifle, wing and trick shot, has created a sensation in England, America, France, and in other countries by her wonderful feats of shooting, and has received handsome presents from many sources. Miss Oakley was born in Darks County, Ohio. Ever since a toddling child she has had an inherent love for firearms and hunting. At the age of ten she, as often as ammunition was attainable, would smuggle her brother's musket and steal into the woods, where game at that time was plentiful. Naturally, she was a good shot, and came home well supplied with game. From the old musket she passed to shooting a muzzle-loading shot gun, and rapidly became such a fine shot that she rarely missed a quail. Then came a local reputation, and with improved fire-arms she attracted wider notice, and for the past four years she has been shooting before the public with great success. 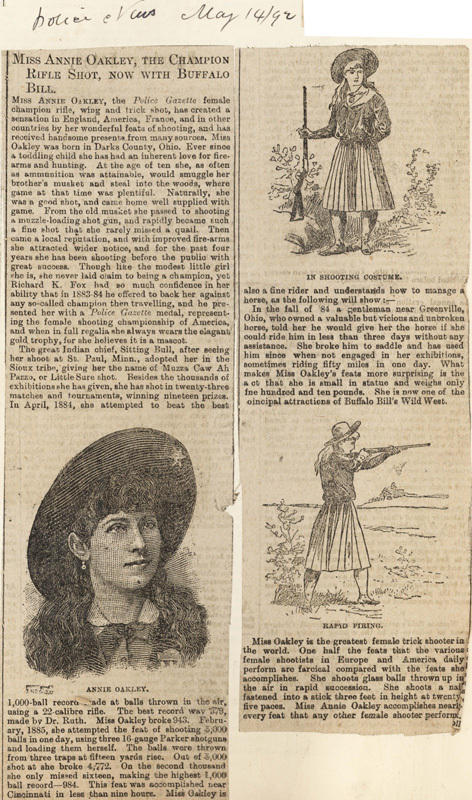 Though like the modest little girl she is, she never laid claim to being a champion, yet Richard K. Fox had so much confidence in her ability that in 1883-84 he offered to back her against any so-called champion then travelling, and he presented her with a Police Gazette medal, representing the female shooting championship of America, and when in full regalia she always wears the elegant gold trophy, for she believes it is a mascot. In the fall of '84 a gentleman near Greenville, Ohio, who owned a valuable but vicious and unbroken horse, told her he would give her the horse if she could ride him in less than three days without any assistance. She broke him to saddle and has used him since when not engaged in her exhibitions, sometimes riding fifty miles in one day. What makes Miss Oakley's feats more surprising is that [f]act that she is small in statue and weighs only [o]ne hundred and ten pounds. She is now one of the oincipal attractions of Buffalo Bill's Wild West. Miss Oakley is the greatest female trick shooter in the world. One half the feats that the various female shootists in Europe and America daily perform are farcical compared with the feats she accomplishes. She shoots glass balls thrown up in the air in rapid succession. She shoots a nail fastened into a stick three feet in height at twenty five paces. Miss Annie Oakley accomplishes nearly every feat that any other female shooter performs.